Directed by Emma De Swaef and Marc James Roels. In French, Dutch, Aka, and Maninka, with English subtitles. 45 min. Directed by De Swaef and Roels. 17 min. Directed by Niki Lindroth von Bahr. In Swedish with English subtitles. 15 min. Gene Siskel Film Center, 164 N. State, 312-846 2800, siskelfilmcenter.org, $11. Puppetry is an art form that goes back millennia. Puppets are referenced in the ancient sacred Sanskrit epic the Mahabharata and shadow theater is still performed throughout India and southeast Asia, while its influence can be seen in the works of silhouette animators from Lotte Reiniger (The Adventures of Prince Achmed, 1926) to Michel Ocelot (Princes and Princesses, 2000). Japanese bunraku puppets have been around since the 17th century, about as long as kabuki theater, and are equally suited for the delicate conveyance of complex emotions. First documented in Samuel Pepys's diaries of 1662 and originally aimed at adults, the hand puppet Punch and Judy shows became prominent in British culture as a form of social satire, later incorporating political commentary (as seen in the introduction of a Hitler character during World War II). These three aspects—the spiritual, the psychological, and the sardonic—combine in a program of three contemporary European stop-action animated puppet films now beginning a weeklong run at the Gene Siskel Film Center. This Magnificent Cake! (2018), written and directed by Ghent animators Emma De Swaef and Marc James Roels (she's Flemish; he hails from South Africa), takes its title from the Belgian King Leopold II's desire for "a slice of this magnificent African cake," as he expressed it during the 1884-1885 Berlin Conference where the European imperial powers were carving up the African continent into their new colonies. When the Belgian government wouldn't finance his ambition, he raised his own money to become sole proprietor of the Congo Free State, and grew immensely rich on profits from ivory and rubber. Conscripted as his workforce, the Congolese were by fiat routinely maimed for not meeting production quotas, and over decades millions more were slain. De Swaef says Belgians don't much discuss this part of their nation's past, and if that sounds like an unusual springboard for a weird but touching animated movie, she and Roels arrived at their subject in a circuitous way. As Roels explained in an interview with Chris Robinson for Animation World Network, "I do remember both of us really getting into Journey to the End of the Night by Céline and being inspired by that. In one chapter, the main character meets a black servant sitting in the kitchen of a manor making bombs. In another chapter, the main character describes going to an African colony to work and how terrible that was. The one idea that stuck with both of us was that it was nearly always the very worst individuals that Europe had to offer who ended up going to these colonies." A feeling of surreal disconnection and an elliptical approach to storytelling distinguish This Magnificent Cake!, which is divided into five chapters with different narratives exploring a similar theme, like some anthology films. Foot-long dolls made of felted wool and often shot in close-up evoke recognizably fallible human beings—including King Leopold II himself, given voice by veteran Flemish actor Jan Decleir (The Memory of a Killer). The royal dotard is a hiccupping bed-wetter who's oblivious to other people's feelings because he's the king, so he can be. After he dismisses a hapless concert clarinetist who got time to play only a few notes, the depressed musician travels to the colonial hotel in the film's second chapter, where he's also mistreated. He then wanders off into the nearby jungle, only to pop up again (tragically, for another character) in the fourth. He becomes a kind of a running gag amid all the brutality and misadventure. The second chapter revolves around a Pygmy who, after tragically losing his wife and children in a fire, is hired by the hotel as a bellhop; when things are slow, he stands in as a hall ashtray for the guests. In this second storyline, another running gag emerges: many bad things occur because of objects rolling and people falling. It's as though gravity adds insult to the injuries inflicted by callous humans. Other chapters follow a drunken embezzler who flees with his money to the Congo; a Congolese porter who mourns the death of a friend; and an army deserter who seeks a new start in Africa. What's astonishing is how much emotion the puppets' fuzzy faces and pillowy bodies convey as the characters stumble and thrash toward their destinies. These mortals are foolish, and we suspect that we, too, are but a mere slip on a banana peel away from them. 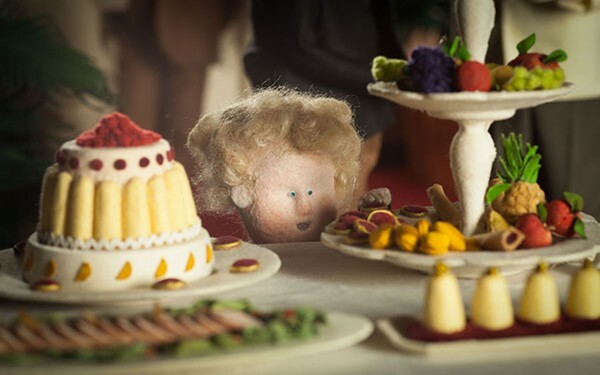 Prior to This Magnificent Cake!, De Swaef and Roels were the toast of film fests around the world—including the Chicago International Film Festival, where they won a Silver Hugo—for their delightful stop-action short Oh Willy . . . (2012). The title is a pun: it may be the name of the main character, and/or a reference to the part of the male anatomy that's on fulsome display in the film's nudist camp setting. After his mother is felled by a stroke, a bereft man returns to the nature- loving commune where she reared him. Although his grief is palpable, as the only clothed person there he's a fish out of water, giving the filmmakers opportunities to take swipes at cultural fads and mama's boys. Just for fun, the directors throw in a yeti as well, a surreal element that nonetheless is the perfect capper for this oedipal tale.